The LTE version liberates your smartwatch from your phone. An embedded SIM card of type eSIM by Gemalto handles the communication, so you can leave your phone behind. Easily take and make phone calls when you're on the run. 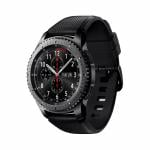 Samsung Gear S3 Frontier LTE shares the same specs as the non-LTE version. A newer model Samsung Galaxy Watch SM-R810 42mm was released in August 2018.